It was May, 1978. Disco dominated the airwaves and the night clubs. In Vancouver, a trio of suburban kids became the first punk rockers invited to perform in a Battle of the Bands showdown. They didn’t win the contest, but their rabid supporters doused the hapless emcee in a shower of beer and spittle. The next obvious step for the new band was to get into a recording studio. They faced a problem. “Everybody hates us, no one will sign us, we’ll never get a record,” remembers Joey Keithley. In the true spirit of punk, the members of D.O.A. decided to DIY — do it yourself. They booked time at Ocean Sound Studios in North Vancouver, located in a cinderblock building with all the ambience of a doomsday bunker. The session went well with only one snag. After the bed tracks had been recorded, it was time for the vocals. Problem was they hadn’t been written yet. In about 15 minutes, Mr. Keithley finished writing the lyrics to four songs. The record was pressed at Imperial Records, where 500 copies of the seven-inch vinyl were ordered. (PTL, the first company Mr. Keithley tried, rejected his business, thinking the songs satanic. Only later did he learn the company’s initials stood for Praise the Lord.) As it turned out, the records played about four seconds faster than the master tapes, a glitch that only made the band sound ever more frenetic. It had all the graphic elegance of a ransom note cut-and-paste by glue-sniffing monkeys. You’d be lucky today to find a copy for anything less than a cool C-note. Thus was born Sudden Death Records, a small label whose sputtering existence over three decades belies its cheeky name. In a city known for having launched the spectacular careers of the likes of Bryan Adams, many more musicians have found an audience and an income, however limited, thanks to the vision and the cash-in-the-beer-bottles-between paydays dedication independent labels, such as Mr. Keithley’s. “We’re a mom-and-pop operation,” said Mr. Keithley, whose wife and eldest son work for the label. The business was left dormant for many years until revived by a line of credit obtained in 1998. The label has handled more than 50 full-length albums from a variety of acts. Perhaps most importantly, it has reissued long out-of-print records by the cream of Vancouver’s late 1970s punk and new wave scene, including music by the Modernettes, the Pointed Sticks, and the Young Canadians. Sudden Death also handled the revival of the legendary Vancouver Complicated anthology. The difficulty in determining who was owed what royalties led all the acts to agree to a shared payment of zero. The lucky beneficiary of the decision was the Vancouver Food Bank, which received a donation for $5,000. D.O.A. will be returning to the studio in the new year to record two albums, one of which will be titled, “This Machine Kills Fascists,” which is the slogan American folk troubadour Woody Guthrie placed on his guitar. Their most recent Sudden Death CD is titled, “D.O.A. 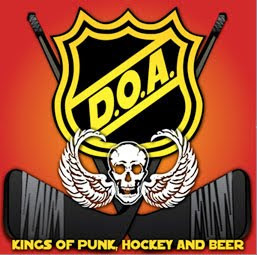 : Kings of Punk, Hockey and Beer.” They love the winter game, icing scofflaw teams in which all the players wore No. 13 sweaters. Playing against D.O.A. was like facing a squad where all your opponents were Tiger Williams. That sense of humour has also marked their approach to music, which can be said to be more political than playful. Over the years, D.O.A. has Rocked For This and Rocked Against That. Their viewpoint has been expressed over the years by a graffito that became a common sight in east Vancouver: Talk minus action equals zero. Disco is dead, while Sudden Death Records continues to entertain the kids. There’s got to be a lesson there. Joe? Capt. 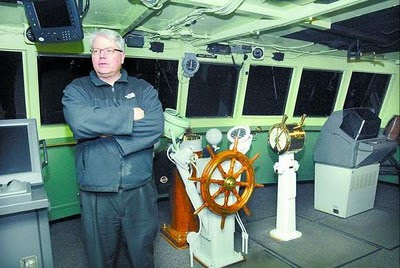 Steven Banfill on the deck of the MV Coho, which boasts a traditional wooden wheel. Photograph by the Olympic Peninsula Daily News. Twice a day, Capt. Steven Banfill’s vessel eases into its berth in the Inner Harbour, a smooth operation run with stopwatch precision. The car ferry dwarfs the yachts and pleasure crafts most often found in the waters fronted by the Empress Hotel, the Legislature and a wax museum. The vessel’s arrival is an impressive sight, as is its departure, marked by a blast of the ship’s whistle. Fifty years ago today, at 10:34 a.m. on Dec. 28, 1959, MV Coho arrived here 11 minutes ahead of schedule. It was a maiden voyage to inaugurate a ferry service across what was then often described as the world’s largest undefended border. The spanking new ship, built in Seattle for a stunning $3 million US, landed at the wharf ahead of the official welcoming party, which included the mayor and other civic dignitaries. The kilted members of the Victoria Girls’ Pipe Band skirled a welcome. “This will create a great deal of business between our two ports,” the mayor told the skipper. There will be considerably less fanfare on the waterfront this week, in part because the Black Ball Ferry Line commemorated the golden anniversary this summer. The company marks its birthday tomorrow when the first sailing open to the public took place. The Coho is a last reminder of the days when this city served as a centre for transoceanic voyages, when a working harbour delivered people and goods into the heart of a city with an imperial heritage and grand economic ambitions. These days, the marine link serves what is mostly a tourist trade, connecting Port Angeles, Wash., to the British Columbia capital. For passengers, the ferry offers a scenic, 90-minute voyage completed at an average speed of 15 knots. For the crew, the sailing is a part of a routine workday. He has been working on the ship since 1967, when, at age 16, he got a summer job as a porter. His duties included moving bags, making up rooms, and cleaning the heads. Over the years, he worked his way up from ordinary seaman to able seaman to first mate, a post he held for a quarter-century. He has been captain for the past five years. The sailings have mostly been without incident, though he does recall some scofflaw sailors nabbing a totem pole from a Victoria street and smuggling it across the border. It was a larcenous act of dubious merit, as it cannot have been two easy to fence a one-of-kind work. As captain, he has had to contend with distracted boaters, some of whom have turned directly in the path of his ship. A 104-metre long ferry with capacity for 115 vehicles and 1,000 passengers does not maneuvre as deftly as a sailboat. Once, as he pulled into Victoria, he faced a swimmer who dove in off Laurel Point with the intent of crossing the ship’s path before it arrived, a calibration that might have succeeded had the bather not forgotten to factor in his own fatigue. Happily for all, a collision was avoided. “Not anybody too amazing,” he admitted. The most notorious passenger is easy to name. Ahmed Ressam, a terrorist, disembarked from the Coho at Port Angeles 10 years ago this month, only to be captured by border guards after a foot chase through city streets. Many of the crew live aboard the ship during week-on, week-off assignments. They have their own rooms, as well as the services of an onboard cook. “We’re our own little city,” the captain said. Black Ball is a venerable shipping name that dates back to 1816, when Captain Charles Marshall’s fleet of clipper ships flew a black ball on a red flag on the New York to Liverpool run. The flag was revived by an ancestor in 1928, becoming a prominent ferry service on Washington and British Columbia waters until most of the assets were sold to the fledgling B.C. Ferries after a devastating strike. By the time the Coho first sailed into port here 50 years ago, the company had already been immortalized in a tune sung by Bing Crosby. 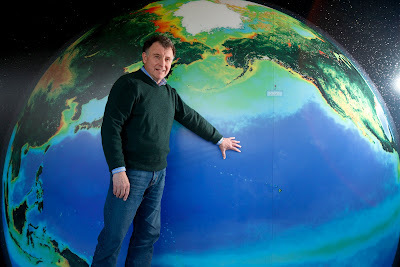 Richard Thomson, an oceanographer, says the Neptune Canada project will aid in understanding tsunamis, knowledge that may someday save lives. Photograph by Deddeda Stemler. YouTube offers a panoply of distractions, from the “dramatic chipmunk” (17.8 million views), to Tillman the skateboarding bulldog (9.8 million), to a wedding procession turned into a boogie fest (35.3 million). Hilarious? Sure. Entertaining? Depends on your standards. Never before seen? Nah. If you want to see something incredible, forget the viral videos and check out Neptune Canada’s YouTube channel. You can groove to the soundless beauty of a sea cucumber undulating on the bottom of the ocean off the coast of Vancouver Island. And if you think movie director James Cameron has the chops when it comes to conjuring alien life forms, then check out a pink Scotoplanes (alias “sea pig”) lumbering along the seabed. A coterie of acolytes zip about like spacecraft hovering around the death star. Humans have scaled the tallest mountains and flown to the moon, but we are only now beginning to explore the vast surface of our planet. The reason? Most of it is under water. Deep water. The “sea pig slow dance” was captured by a camera several weeks ago in the middle of an abyssal plain at a depth of 2,660 metres. This is the site of Ocean Drilling Program 1027, part of the world’s largest ocean observatory, the North East Pacific Time-Series Undersea Networked Experiments (Neptune), a project based at the University of Victoria. An loop of powered fibre-optic cable has been placed along the ocean floor from where sensitive devices will take constant measurements. The cable loops about 800-kilometres along the seabed, long enough to stretch from Toronto to Ottawa, though considerably wetter. Scientists from around the globe will conduct deep-sea experiments, while all the data compiled from the observatory is being made available to the public on the Internet. In the past, ships have lowered instruments into the ocean, taking snapshots of conditions. Now, scientists will benefit from having a constant stream of data. It is the difference between a scrapbook of black-and-white photographs and a high-definition movie. Scientists say the observatory will vastly increase our knowledge about the ocean, as well as of our planet. The site where the sea pig was caught on candid camera also includes a broadband seismometer and pressure recorders, which monitor changes caused by earthquakes, plate strain, and hydrothermal convection. With the tide gauges maintained by the Canadian Hydrographic Service, scientists such as Mr. Thomson will be able to track and study the spreading and buildup of waves. “We’re going to be better prepared for tsunamis,” he said. That information could be of life-saving importance, especially for such communities as Port Alberni, which is at the end of a channel known to increase the impact of surging waves. On Sept. 29, a devastating 8.0-magnitude earthquake struck south of the Samoan Islands, generating a tsunami that inundated the low-lying parts of the South Pacific islands. Eleven hours later, Neptune’s pressure recorders near Ocean Drilling Program 1027 in the Cascadia Basin began recording the leading waves as the tsunami continued its transoceanic spread. Four waves crested at about 10-minute intervals with a maximum height of five centimetres. As those waves neared the shore, crossing the continental shelf and pushing into bays, the tsunami waves amplified to 8 cm at Victoria and 18 cm at Port Alberni. Waves from the event rebounded around the Pacific for days afterward. Unfortunately, one part of the tsunami measuring system could not be deployed on the ocean floor this summer because of an approaching storm, so some valuable data was missed. Nonetheless, scientists can now use the numbers from the Samoan tsunami to refine models for predicting tsunami hazards along this coast. Mr. Thomson is also keen to learn more about the zooplankton found at undersea thermal vents. “Where the hell do they come from? What’s their source? With Neptune’s unblinking eye and constant recording in real-time, those and many, many other questions will be answered in coming years. With the information available to all on the Internet, we can look over the shoulders of the scientists to see for ourselves. Martin Ashwood-Smith uses his downtime as a hack to create crossword puzzles. Photograph by Deddeda Stemler. Martin Ashwood-Smith, a man of erudition, is not one to use a $5 word when a simple one will suffice. Or do. Not that he lacks for vocabulary, for he is a loquacious personage of extraordinary dexterity. A driver for Blue Bird Cabs, he often engages in palaver with customers. Though ferrying pedestrians engages a man in an honest, fulltime occupation, it is common for fares to query the driver about his true calling. Sometimes, he informs passengers of his pastime. Other times, he is a model of discretion. Not all behave well when told. “A lot of people will change the subject immediately,” he said. In his downtime, Mr. Ashwood-Smith, 52, constructs crossword puzzles. He is a word artist whose palm-sized canvas is a square divided into 15 rows across by 15 rows down, a grid in which the goal can be to use as few black squares as possible to break up words. Fresh clues and a symmetrical design separate the amateurs from the professionals. Word mavens know Mr. Ashwood-Smith as the king of the triple stacker for his talent in creating puzzles with three consecutive 15-letter answers. He likes wide-open puzzles so lacking in black squares as to look like a printer’s error. He was praised earlier this month in Wordplay, the New York Times’ crossword blog, for a grid published Dec. 2 in which only 30 black squares were used. The central three horizontal rows were so-called Stack 15s. The puzzle had several sharp clues. The answer for “Competition among mail carriers” was JOUST. The four-letter answer for “Cashiers” was CANS, which at first is a head-scratching response, only making sense when you realize both words are verbs. Born in London, England, a city whose drivers of black cabs are renowned for learning the Knowledge, the detailed routes and history of the metropolis, Martin grew up in the sleepy Berkshire village of Hermitage. The Didcot, Newbury and Southampton Railway ran through the community, but the line had been abandoned by the 1960s, providing the boy a verdant ribbon along which he could explore nearby forests, a local brickworks, and the ruins of a Roman villa. Ordnance survey maps were his guide, the setting sun his only limitation. The boyhood idyll was interrupted in 1969 when his father rejected the offer of a job in forensics with Scotland Yard to instead accept a faculty position in biology at the University of Victoria. A reverie in the English countryside was replaced by suburban life in Canada where a young emigre with an accent and a hyphenated name stood out. At university, he eschewed his father’s discipline, instead opting for studies in history. He drew a regular cartoon lampooning religion for the student newspaper, spending his spare time in the campus pub designing cryptic crosswords. He later placed a puzzle in a local shopper. “We got a huge response from the readership,” he said, “because everyone solved it.” The response at The Beaver, a watering hole in the Empress Hotel, was less enthusiastic. The habitues, counting among their number many writers and autodidacts, found the puzzles far too simple. A tough cleverness developed in a bar filled with smartypants. In 1990, a batch of puzzles for Monday Magazine were rejected. He boldly decided to submit one to Eugene T. Maleska, who edited the New York Times’ popular puzzle. A rejection at home led him to the big time in Gotham. He has since placed more than four dozen crosswords in the Times. He is paid $200 US for each, $1,000 for the larger Sunday puzzle. Puzzle making can be a lonely exercise. Whenever he answers a question about the nitty-gritty of puzzle construction, he finds that eyes glaze over and yawns are not always stifled. Some years ago, at a convention, he met the prolific crossword compiler Manny Nosowsky, a retired urologist from San Francisco who is said to have once offered the clue “northern air” for the solution O CANADA. Mr. Ashwood-Smith was reluctant to discuss construction until Mr. Nosowsky offered words of encouragement. Jimmy McLarnin, a slip of a boy, endured beatings while defending his newsboy turf at the Vancouver dockyards, a prized spot to sell the Daily Province. He learned to take a punch at the waterfront. After his father bought boxing gloves, he learned how to throw one. Young Jimmy soon fell under the tutelage of a stevedore whose harsh experiences in the ring and on the battlefield failed to extinguish a generosity rare among his kind in the boxing fraternity. Charles (Pop) Foster was a trainer and manager who offered tactical advice in the ring and strategic wisdom in selecting fighters outside it. Mr. Foster saw in the skinny kid the possibilities of a world-class fighter, a proposal so unlikely as to be laughable. Yet he proved to beright: Mr. McLarnin went on to twice hold the world welterweight title. Handsome as a choirboy, Mr. McLarnin was called Baby Face. For years, tough men tried to rearrange his features while attempting to knock his block off. Some defeated him, and one even knocked him out, yet he marked his 85th birthday with nary a scar on his face. Long after he had hung up his gloves, he was only three pounds over his fighting weight. He invited a guest to squeeze his bicep, struck an ancient pugilistic pose, pantomimed the telling blows from his championship bouts by dancing across his kitchen floor. In his day, Mr. McLarnin's name was as famous as those friends with whom he hobnobbed from Broadway to Hollywood. He taught Babe Ruth to box over drinks at Dinty Moore's and ate a slice of lemon pie with the gangster Legs Diamond. The boxer starred in newsreels and magazines, golfing with Bob Hope and Bing Crosby, squiring Jean Harlow and Barbara Stanwyck. Away from the cameras, he politely turned down Mae West's entreaty to come up and see her some time. After all, he was carrying a torch for a girl back home. Newspapermen loved him, for he fit every Irish stereotype except that of the drunkard. Reporters who sometimes scripted an athlete's clever comments had no need to do so with Mr. McLarnin, whose wit befit the primitive appeal of his sport. Unlike many in his racket, Mr. McLarnin left the fight game with his money and his wits. His sole tragedy was to outlive his beloved wife. Later, he often wept over her absence. James McLarnin was born near Belfast, Northern Ireland, the fifth child of what would be an even dozen. The young family emigrated to Canada three years later, settling on a wheat farm near Mortlach, Sask. The wet miseries of an Irish winter were paradise compared to the Prairie cold, so the McLarnins moved to Vancouver where they lived in a modest house at 662 Union St. in the rough-and-tumble Strathcona neighbourhood. “What kind of a boxer?” the father asked. One of the odder boxing partnerships was born in that moment. Few would be as successful. None would be as lasting. A veteran wounded three times in the Boer War and once during the Great War, Mr. Foster's youth had been spent as a booth fighter on the carnival circuit in Britain. His act was to fight all comers — any man, any weight. A challenger earned a pound for every round they lasted, an attractive prize in the Victorian era. A pound-a-round fighter like Mr. Foster only survived by dispatching opponents quickly, otherwise he might end a long day poor, hungry and beaten. Young Jimmy McLarnin possessed a crushing right, honed on the chins of other newsboys. Mr. Foster, a gruff Yorkshireman, knew a one-punch fighter had limited prospects, so during training sessions he tethered his pupil's stronger hand behind his back. Tutorials in southpaw fisticuffs were followed by lessons in footwork. Sawdust was sprinkled across the floor of the basement of his father's store so the young fighter could learn to glide like a dancer. In time, a crunching right hand would be Mr. McLarnin's greeting card in the ring, a corkscrew left hook his way of bidding adieu. He established himself as a comer by winning two of three bouts against Fidel LaBarba, a Los Angeles high-school student recently returned from the Olympic Games in Paris with the gold medal in the flyweight division. The third fight was a draw. Mr. Kaplan was floored in the eighth round. The win earned Mr. McLarnin his first shot at a title. He faced slick Sammy Mandell at the Polo Grounds in New York, but the champion proved elusive, thwarting the challenger with deft left jabs. The 15-round fight ended with a unanimous decision, the verdict visible on Mr. McLarnin's face, as his left eye was swollen shut and blood streamed from his nose. He was, read one account, “a sorry sight.” Five years passed before he got another shot. In boxing's unsubtle marketing, fortunes were to be made pitting an Irish Republican (even if he had been raised a Methodist) against sons of the synagogue. 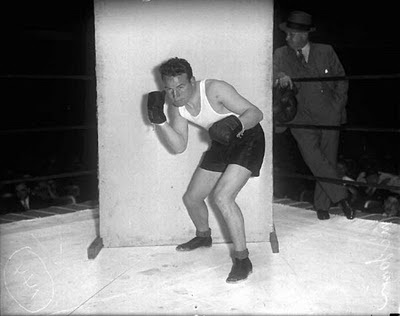 So, Mr. McLarnin fought a procession of Jewish boxers, knocking out Sid (Ghost of the Ghetto) Terris in one round, Ruby (Jewel of the Ghetto) Goldstein in two, Al (Battling Bronco of the Bronx) Singer in three, and the great Benny Leonard in six. A chance for redemption from his earlier title defeat came in Los Angeles on May 29, 1933, when he faced welterweight champ Young Corbett III, an Italian-born southpaw born Raffaele Giordano. Mr. McLarnin needed just 2 minutes, 37 seconds for a knockout. “It all happened so fast I didn't have time to pray,” said Sam McLarnin, who was at ringside to see his son fight for the first time. After 14 tough years, Pop Foster's ridiculous promise had come true — Jimmy McLarnin was world champion. In Vancouver, the manager of a movie house halted a screening to announce the news; the newspaper young Jimmy had hawked ran banner headlines; trolley-car drivers rang their bells. His next three fights, all with the title in the balance, occurred against Barney Ross. These were vicious affairs between two ferocious fighters. They began the showdown as rivals, ended it as legends. Mr. McLarnin lost the title in a split decision on May 28, 1934, won it back again on another split decision on Sept. 17, lost it for good in a unanimous decision on May 28, 1935. Their ultimate battle, before 40,000 fans at baseball's Polo Grounds, under the eye of referee Jack Dempsey, turned into brutal slugfest by the eighth round. Ross, his left hand broken, absorbed a series of left hooks to the head before retaliating with an onslaught of rights. Exhausted, the pair abandoned all pretence of artistry to simply unload whatever punches they had left. The decision earned a cascade of boos. Spectators debated the merit of the verdict, but none doubted they had witnessed boxing history. That summer, after a long courtship, Mr. McLarnin married Lillian Cupit, a Vancouver teacher. 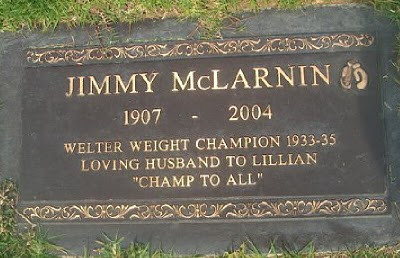 Mr. McLarnin fought only three more times, ending his career with a decisive pounding of Lou Ambers on Nov. 20, 1936. He retired with a record of 63 wins, 11 losses, three draws. Only once did he not finish a fight on his feet. Mr. McLarnin did well in life's neutral corner. After winning an estimated $500,000 (U.S.), he was able to resist the lure of hefty purses for a comeback. He golfed, dabbled with investments and attended the Cauliflower Alley Club in Los Angeles with other retired boxers and wrestlers. When Pop Foster died in 1956, Mr. McLarnin and his wife received two-thirds of an estate estimated at $200,000 (U.S.) in cash and bonds. Most of the remainder went to the four McLarnin children. Following the death of his wife in 1985, Mr. McLarnin moved to eastern Washington state, where three of his four children live. In recent years, he receded into a dementia that made him it difficult for him to speak. He accompanied his daughter on day trips and always enjoyed a slice of his favourite pie on his birthday, yet ate only the pecan filling. Whatever the fog of his memory, he remembered a fighter does not eat fatty pie crust. Jimmy McLarnin was born on Dec. 19, 1907, in Magherageery, Ireland. He died on Oct. 28, 2004, in Richland, Wash. He was 96. He leaves daughters Ellen, Jean, Nancy; son Jim and two sisters. He was buried at Forest Lawn Memorial Park in Glendale, Calif., between the graves of his wife and his manager. It was New Year’s Eve. Paul Hyde spent the final hours of 2004 performing at a CBC Songwriter’s Cafe with Shari Ulrich and Linda McRae. The evening had gone well. The event, part of First Night festivities in downtown Vancouver, was dry. The audience included many families. After the fireworks, he made his way back to the car, only to discover a shattered window. The interior had been rifled. Four bottles of fine wine hidden beneath a seat were gone. No stranger to life in the urban jungle, he blamed himself for parking on a dodgy street. 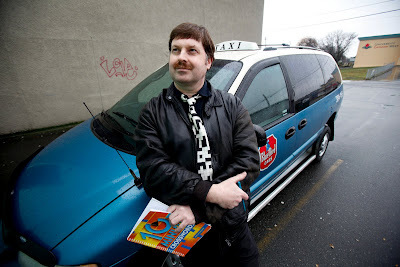 On the drive home to eastside Vancouver, he saw prostitutes plying their trade on street corners near the waterfront, a common enough sight but one on this night that struck him as particularly horrible. The image stuck with him. This is a time of year when passersby drop a few more coins into the outstretched cap of a stranger, when donations are made to food banks and clothing charities, when the nuisance of being accosted in the streets is tempered by a spirit of seasonal goodwill. Otherwise, sympathy to society’s abandoned can run thin on the hard streets of the big city. Mr. Hyde, 54, who was born at Harrogate, Yorkshire, has long been attracted to gritty storytelling in songs, from Ralph McTell’s “Streets of London” to “Fairytale of New York” by Shane MacGowan and Jem Finer of the Pogues. “I’m not very good at over-the-top love songs. Or doo-doo-DOO-da-da-DA,” he said. He is not wanting for material, living as he does on a street north of the Pacific National Exhibition near a trysting place favoured by johns and prostitutes. “It’s all around me,” he said. His own sardonic style of songwriting led to hits and mass sales, as well as Juno Awards, during his years with the Payola$. He reunited with boyhood friend Bob Rock to create a new Payola$ album two years ago. Far less well known are the wonderful songs crafted by Mr. Hyde on his solo albums, which have had a limited circulation. A shot at a breakthrough ended in circumstances so bizarre they are (almost) comical. The actor Russell Crowe had picked up on a Hyde song and covered it for his own debut album. Mr. Crowe was scheduled to appear on Oprah to discuss his new record, including the Hyde song “I Miss My Mind the Most,” but instead wound up handcuffed in policy custody after throwing a telephone in the face of a Manhattan hotel concierge at 4 a.m. No Oprah, no album promotion, no invitation to write movie soundtracks for Russell Crowe vehicles. More recently, Ron Wood of the Rolling Stones recorded two Hyde-Rock compositions for a solo project of his own. In an echo of the Crowe incident, Mr. Wood has been in the tabloids for a complicated and messy personal life. Seven weeks ago, Bongo Beat records of Montreal released Mr. Hyde’s “Peace Sign,” a 12-song compact disk featuring on the cover the Vancouver Special in which Mr. Hyde lives. In the front yard is a peace sign made of Christmas lights strung through a large square of pegboard. He lives on a “streets of lights.” The peace sign and a decorated Charlie Brown tree are his acquiescence to his neighbours’ obsession. The album is filled with brilliant songs, from an description of life in an Ontario industrial city (Hamilton as “Greaseball Town”) to a folksy ode to a seaman’s life (“Sailors Song”). He even has included a love song. It is Mr. Hyde’s great talent to write sharp-eyed character studies of the rejected, the forgotten, the unloved. He imagines the lives of the down and out with sympathy and without mawkish sentiment. He is not unfamiliar with being in a state of penury. As a young man, he and Mr. Rock abandoned suburban Victoria to go to England to become rock stars. That didn’t happen, so they hit the road, depending on the generosity of strangers and their own wiles. They spent one frigid January night sleeping in a railway workers shed along an isolated stretch of track in Alsace-Lorraine. Though penniless, Mr. Hyde shunned begging, or even busking. Not his style. Not that he’s always an easy touch himself on the street. “There’s a lot of assholes out there who bum because it’s easier to do that and go drinking than it is to go to work and go drinking,” he said. The image of prostitutes staggering into Powell Street in the opening minutes of a new year inform the song “Quick, Before It’s Too Late,” a haunting recognition of a sad fate. “Who doesn’t love you now. It is harder to imagine a song better capturing our conflicted relationship with society’s castoffs, whose unhappy fate seems all the more painful at this time of year. Freeman Tovell, a retired diplomat, has written a definitive biography of the Spanish mariner Juan Francisco de la Bodega y Quadra. Photograph by Deddeda Stemler. If history were more fair, Freeman Tovell could say he lived on Quadra’s and Vancouver’s Island. The largest island on the coast, not to mention the largest metropolis in what is now British Columbia, carries the name of the British mariner George Vancouver. Mr. Tovell grants Vancouver his due, but has taken as his cause the restoration of the forgotten accomplishments of the Spanish mariner Juan Francisco de la Bodega y Quadra. The Spanish sea captain, known for his hospitality, befriended Chief Maquinna at Nootka Sound, later settling a dispute with his British rival, thus avoiding an international conflict. These days, the atlas is speckled with the names of Spanish sailors — Haro, Galiano, Malaspina— who visited these waters more than two centuries ago. Quadra’s name graces a downtown street in Victoria (as does Vancouver’s), as well as a large island near Campbell River. A California bay north of San Francisco is named Bodega. Looking back, it might appear as though his entire life was preparation for a book that consumed so many years. As a boy growing up in Ontario, Freeman’s passion for the sea was indulged by his parents, who presented him at age 14 with George William Anderson’s 1784 edition of “Cook’s Voyages,” soon after adding the two oversized volumes of “Harris’s Voyages,” published in 1764. The books remain a treasured part of his library to this day. The same year in which he received the account of James Cook’s adventures, his mother published her first book. Ruth Massey Tovell’s “The Crime in the Boulevard Raspail” was a mystery novel set in Paris featuring a Canadian heroine investigating fakes of famous paintings by Van Gogh and Cezanne. Freeman Tovell earned history degrees from the University of Toronto and Harvard, taking time out from his studies in 1940 to serve as best man at the New Year’s Eve wedding of his good friend, and future George Brown biographer, J.M.S. Careless. With war raging, Mr. Tovell enlisted in the Royal Canadian Naval Volunteer Reserve, an obvious choice of military service for one so enamored with the sea. Posted to the Canadian Naval Mission Overseas, based at London, England, he soon transferred to the external affairs department, where he would remain for many years. During the mid-1950s, he worked in Ottawa as an executive assistant to Lester Pearson, the future prime minister who won the Nobel Peace Prize for his work in resolving the Suez Crisis. In 1963, Mr. Tovell was named ambassador to Bolivia and Peru, a fortuitous appointment. His wife, the former Rosita LaSueur, was the daughter of a Canadian oil company executive and a Peruvian mother, so the couple had relatives to welcome them to their new home in Lima. As well, Bodega y Quadra had been born in the city, so Mr. Tovell’s familiarity with the colonial history of what was the viceroyalty of Peru would come in handy when writing his book many years later. However, in December, 1963, he found himself in the midst of an international crisis, when militant tin miners, described in one account as “bearded young admirers of Cuba’s Fidel Castro,” seized hostages, including four Canadians, four Americans, a West German, a Dutch mine manager, and 12 Bolivian technicians. Mr. Tovell traveled to La Paz to aid in the negotiations. The Bolivian government sent 4,000 troops to the workers’ Andean stronghold at Catavi. The last of the hostages was released unharmed after a 10-day standoff. Mr. Tovell’s final act as ambassador was to preside at the opening of a cancer clinic for children donated by Canadians living in Peru. He settled in Victoria in 1978, teaching at the university and soon after beginning work on a book that received praise on publication. “Splendid,” said the Oregon Historical Quarterly. “Fascinating tales of courage diplomacy, and intrigue when Victoria was still unknown on the far reaches of the Spanish Empire,” trumpeted the Victoria Times Colonist. Earlier this year, Mr. Tovell was surprised when the Canadian Nautical Research Society, meeting in Victoria, presented him with its prestigious Keith Matthews Award for Best Book. In an age when it is seen as historically appropriate to return to the official use of Haida Gwaii to describe what had temporarily been known as the Queen Charlotte Islands, perhaps someday Mr. Tovell’s contribution will help restore his subject’s name to a grand island. 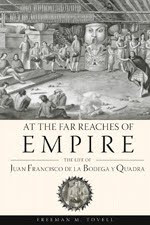 Click here to read the first chapter of Freeman Tovell's biography of Juan Francisco de la Bodega y Quadra. John Mann stars in "Beyond Eden," a musical to premiere during the Cultural Olympiad next month. 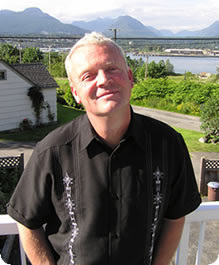 John Mann stood alone on a carpet on the wooden floor of the Cultch, guitars on stands to one side, a harmonica on a neck rack within reach, a trio of drinks arranged on the periphery. He had water, red wine, and a syrupy herbal drink, the selection a vocalist’s nod to neuroses. Mr. Mann returned to the stage on the weekend for the first time since undergoing surgery. He was in fine form, at times pogoing like a madman, singing songs found on his solo albums, as well as tunes made familiar with the band Spirit of the West. He also treated the audience to a sneak listen to the title song to a musical to premiere next month as part of the Cultural Olympiad. He presented an intimate, confessional set during which he teased himself for doing too much talking and not enough singing. It felt like sitting in a living room at a house party. If he was being familiar, perhaps it was because so many friends and relatives were in attendance. On Friday, his wife and son were joined by Mr. Mann’s parents and brother, a family on hand to celebrate a return to health. He had a busy autumn planned with solo performances across rural Manitoba. 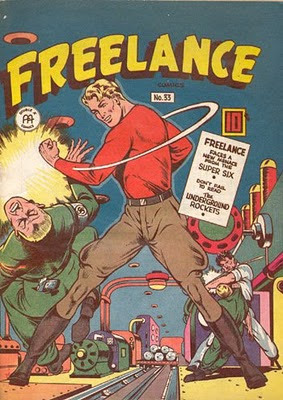 (As a solo artist, he performs as Mister Mann, which makes him Mr. Mister Mann in this newspaper.) The Spirit of the West were also to travel to Afghanistan to play for the troops. Some 30 shows had to be jettisoned. While performing as Thenardier in “Les Miserables” this summer, Mr. Mann felt cramping in his stomach. Figuring it might have been something he ate, he ignored the pain for a few days until blood appeared in his stool. As hard as it was, he now has insight into the lives of others with the disease. “You’re in this club you don’t really want to be in,” he said. Being sick gave him insight into the lives of friends also suffering from cancer, including one who has been given a year to live. With a long, lean face and a shaved head, Mr. Mann presents a sinister visage much unlike what is expressed by the sensitive, clever dude apparent in his songwriting. 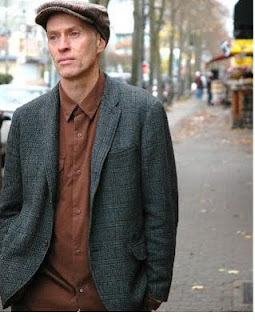 When he dons a working man’s cap, as he does on the cover of his 2007 compact disk “December Looms,” he has an uncanny resemblance to Keith Carradine as Woody Guthrie. He told the audience at the Cultch a story about a bewildering incident during the filming of “Lone Hero,” a 2002 movie in which a biker gang led by Lou Diamond Phillips terrorizes the residents of a small Western town. During a break, the actors stood in a circle, still sporting makeup tattoos and wearing leather costumes. They were chatting about their children and other mundane matters when the director interrupted, making a beeline for Mr. Mann. Written by Bruce Ruddell with musical direction by Bill Henderson, formerly of Chilliwack, the musical premieres on Jan. 16 at the Vancouver Playhouse. The musical is based on a 1957 expedition to the Queen Charlotte Islands by the archeologist Wilson Duff and his Haida friend, the artist Bill Reid. Mr. Mann portrays a character based on the archaeologist, a man who travelled to Haida Gwaii to preserve totem poles, which he bought for $50 each. These can now be seen at the Royal B.C. Museum in Victoria and the Museum of Anthropology in Vancouver. “Off the top he believes his job is to keep those poles alive because you can learn from them,” Mr. Mann said. “If they rot, they’re lost, they’re gone forever. No one will be able to study them. John Mann performs Political at a house party in Ontario in August. Billboard Magazine has named Daniel Powter’s “Bad Day” as the one-hit wonder of the decade. The song, which spent five weeks at No. 1 on the charts, was used as the kiss-off when a hopeful was dispatched during the fifth season of the hit television program “American Idol.” As detailed in this space three years ago, the Okanagan-born singer reworked the lyrics while riding the ferry between his home in Victoria and his producer’s West End apartment in Vancouver. Some of the vocals for the demo were recorded in the bathroom. 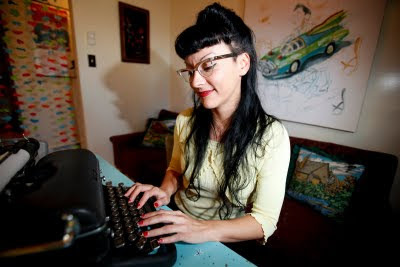 Yasuko Thanh contemplates an ancient writing machine at her Victoria home. Photograph by Deddeda Stemler. Yasuko Thanh sat with friends in the balcony of a theatre for the presentation of prestigious literary awards. 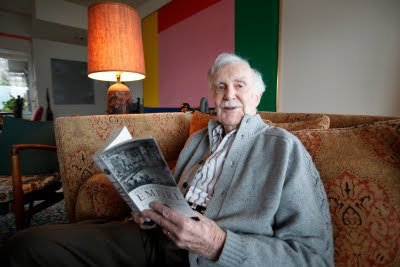 Among the literati sought from up high were Alice Munro, the goddess of the short story, and, one of Ms. Thunh’s favourites, David Bergen, the prize-winning Winnipeg author who was born at Port Edward, the isolated fishing village on the northern British Columbia coast. The other prize to be awarded was a mouthful — the 2009 Writers’ Trust of Canada/McClelland & Stewart Journey Prize. It came with a cheque for $10,000. That’s a grand for each of the words in the title, including the year and the ampersand. Think of it as a 6/49 jackpot for emerging writers. The nominees included Dave Margoshes, a Regina author who was once a reporter at the Vancouver Sun, and Daniel Griffin, a Victoria writer and Camosun College instructor. Ms. Thunh earned a nod for “Floating Like the Dead,” an unflinching story about the last three men living at a leper colony on an islet near Victoria. Her story is fiction, but the setting is all too real. In 1891, a police sweep through Chinatown led to the seizure of five men suffering from leprosy. They were dispatched to D’Arcy Island, an 83-hectare island in Haro Strait off Cordova Bay. Over the years, some 49 men, all but one ethnic Chinese, were exiled to the island, where their only official contact was the irregular arrival of a supply ship. The island, which has been part of the Gulf Islands National Park Reserve for the past six years, served as a lazaretto as late as 1924. Three years ago, a friend’s casual mention of the old leper colony surprised Ms. Thanh, who, though born in Victoria, had never heard of the place. She could find little more than a sentence here and there in history books. She then decided to recreate life in the forgotten colony. She spent hours on the beach at Mayne Island, where she was then living, trying to imagine the ailing men who had been dumped on an island where they had to construct their own quarters and grow their own food. Her story is a haunting tale of abandoned souls who survive through their own industry. One of them dreams of escape. He tries to buy passage off the island with a pocket watch stolen from the corpse of a man who had died the previous night. Ms. Thanh submitted her story to the Malahat Review, a quarterly publication based at the University of Victoria, where she is now completing her master's degree in the writing department. She waited. And waited. And waited. After a year, she contacted the review, which, as it turned out, had misplaced her manuscript. It happens. She then sent it to the Vancouver Review, where it was accepted for publication. When her story about the men in the leper colony was named the Journey Prize winner, the bimonthly magazine won $2,000 of its own. Ms. Thanh, 38, is donating some of her prize money to Plan Canada, which will provide a scholarship to a young woman completing her high school studies in Africa and provide literacy training for two other women. As well, Ms. Thanh purchased a “library in a box,” which provides books to children living in isolated, rural communities. Her writing is not only finding readers, but creating them. Yasuko Thanh reads a selection from "Floating Like the Dead," this year's Journey Prize story. 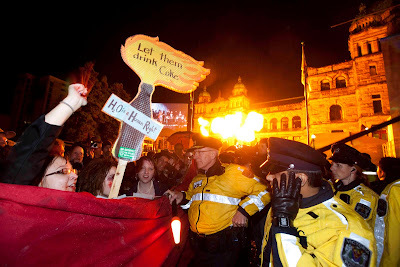 Liberal MLA Harry Bloy described anti-Olympic protesters, such as these seen on the lawn of the B.C. Legislature, as terrorists. John Lehmann photograph. The events no one wants to see at the Olympics are the barricade steeplechase, the truncheon two-step, or the freestyle Taser. Last month’s launch of the torch relay in Victoria offered a hint of the ugly possibilities of confrontation between demonstrators and security forces. The protestors blocked a street, forcing the torch convoy to take a detour. It was reported marbles were tossed, a danger to police horses, though the culprit was never identified. No arrests were made. Some good people were inconvenienced, notably those runners whose turn with the torch was interrupted. There are plenty of reasons to oppose the Olympics, but the behaviour of protestors in Victoria is unlikely to win converts to their point of view. How about this for a slogan: No chanting expletives within earshot of schoolchildren on native land, stolen or otherwise. With an Olympic history suggesting little tolerance for security threats, understandably so in the wake of the 1996 bombing at the Atlanta Games and, especially, the gruesome murder of Israeli athletes at Munich in 1972, the potential exists for demonstrations to descend into street clashes. Vancouver also has the unsettling history of the RCMP attacking protestors in 1997, the infamy of Sgt. Pepper and the joking dismissal of the incident by the prime minister. With 72 days to go before the start of the Games, Vancouver lawyer Leo McGrady has issued a revised version of a manual describing how to exercise your rights when dealing with the police at a public demonstration. An online version of the “Protesters’ Guide to the Law of Civil Disobedience in British Columbia: Olympic Edition” can be found at the Lawyers’ Rights watch Canada website at www.lrwc.org. The guide began as a three-page sheet distributed in 1970 to help protect those demonstrating against the Vietnam War. The first revision came in 1973 to aid those protesting American involvement in the coup in Chile. The guide has since expanded to 43 pages, including entries on what to bring to a demonstration (identification, water bottle, prescription drugs in original packaging) and what to leave at home (illegal drugs, contact book, anything resembling a weapon). The guide’s purpose is to outline ways of engaging in civil disobedience without violating bylaws, or the Criminal Code. Mr. McGrady’s guide is a considerably more worthwhile contribution to the public conversation than an intemperate statement by Burnaby-Lougheed MLA Harry Bloy. A few days after the Olympic torch began a cross-country trek, the Liberal backbencher stood in the Legislature to provide his reaction to the demonstrators who interrupted the relay. Apparently, you’re either with the Olympics, or you’re a terrorist. At the end of my block, neighbours gathered to cheer on the torch runner, who was recognized by some in the crowd as a local teacher. The sound truck blaring praise for a sponsoring cola was obnoxious, but there was something likably Canadian about a co-operative effort by ordinary citizens to pass a torch by hand across this vast land. One family from down the block wore Cowichan knit toques, an expression of solidarity with the women whose craft got belated recognition from Olympic organizers. Some Olympic opponents offered tongue-in-cheek acknowledgement of Bloy’s black-or-white view. “Good news, I’m a terrorist. You could be, too,” the musician Matthew Good headlined a post on his blog. Olympic rhetoric scoreboard: Matthew Good 1, Bloy Wonder 0. Both should check out the Olympic Edition of Mr. McGrady’s guide, a mandatory document for demonstrators that should also be on the required reading list for all peace officers.